Comment: This is one of Manfrotto’s best fluid heads and it works wonderfully. For those of us who can’t yet afford an O’Connor hear… this is one of the next best things. Description (from Manfrotto): The MVH500AH is a lightweight head with a wider platform for HDSLR bodies which has a sliding plate which travels to balance the latest interchangeable lens cameras. The entry-level 500 ensures smooth shots and fine control with up to 5kg (11lbs) of equipment. It’s the most compact head in our successful Bridging Technology™ range and it replaces the Manfrotto 701HDV video head. Beautifully smooth shots: the 500 has professional fluid cartridges on both pan and tilt axes to ensure that every camera movement is smooth, controlled and precise. Faster, easier and safer to use: the side lock system allows the camera and sliding QR plate to click quickly into the head from above, instead of needing to be aligned and slid in from the back. No secondary safety lock is necessary. The side lock system also makes it quicker and simpler to lift the camera out of the head from above. The 500 has a pre-set counterbalance of 2.4kg (5.3 lbs), but is able to support equipment of up to 5kg (11 lbs). The 500 has one Easy Link 3/8” connector to allow an external monitor or other accessory equipment to be fitted. MVH500AH head with flat base tripod mount for attachment to a hybrid photo/video tripod, a traditional photo tripod, slider, a monopod or other supports. Comment: A great "starter" fluid head. Description (from B&H): The Manfrotto 502HD Pro Video Head with Flat Base (3/8"-16 Connection) is an affordable yet remarkably full-featured professional head that represents an advance over the popular 501HDV, with sturdier construction and featuring Manfrotto’s patented bridging technology (inherited from the 509HD and 504HD heads). 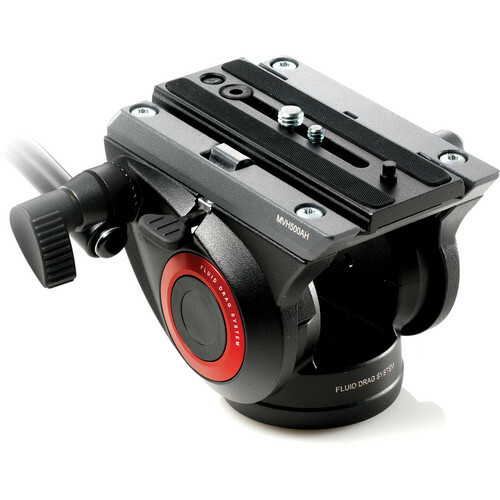 This head is designed for executing cinematic moves with compact camcorders and DSLR video cameras. The 502HD comes in two versions — the "AH" flat-base version, which this one is, and the "A" ball-base version, which is separately available. Weight capacity is 12.2 lb and counterbalance supports 8.8 lb. It can support 13 lb as a static weight. The balance plate’s 3.27" range allows you to correct for uneven payloads that might be due to matte boxes or exotic DSLR rig configurations. Comment: This is THE head I would get if I was looking to start in video and was on a budget. It’s pretty rock solid – you’ll do fine w/ a basic HDDSLR kit on it – but don’t expect to put a full cage w/ accessories or a long lens on it as it’s not meant to support that type of weight… for that I’d go straight to the 526 head below. 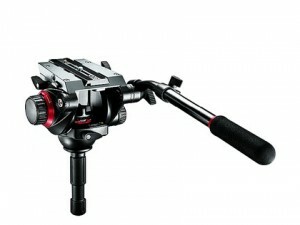 Description (from Manfrotto): The 504HD is Manfrotto’s latest video fluid head. It is a perfect balance of design and performance. The bridge design improves the head’s rigidity and its PAN friction control is fast, simple to fine-tune and protected from knocks. All structural components are made from aluminium, with the PAN axis rotation unit using ball bearings to obtain smooth, totally vibration-free controlled movements that can be directly adjusted using the head’s FDS variable friction system. FDS on both the PAN and TILT axes also ensures that the head works perfectly at all temperatures, with all types of equipment and under all loads. Ergonomically improved lever and dial designs combine with the new friction index to give you complete control over the 504HD. Comment: This is the head I used for well over a year before I got turned onto the O’Connor 1030HD below. It’s pretty rock solid and will support just about anything you throw at it in terms of weight… this is definitely a great long-term investment. No question. So why the O’Connor over this head? Basically you have a much more professional build on the O’Connor (granted at a much higher price point) – the main difference is the friction control, and the ability to switch directions seamlessly with the O’Connor mid-motion. You’ll be able to do that with the 526 – but it’s a bit more difficult, and the head may sometimes jerk a bit when you change pan/tilt directions RELATIVE to the O’Connor. When you work with an O’Connor it’s hard to go back to anything else – because the head is so smooth that it makes your moves look like a veteran’s moves.. 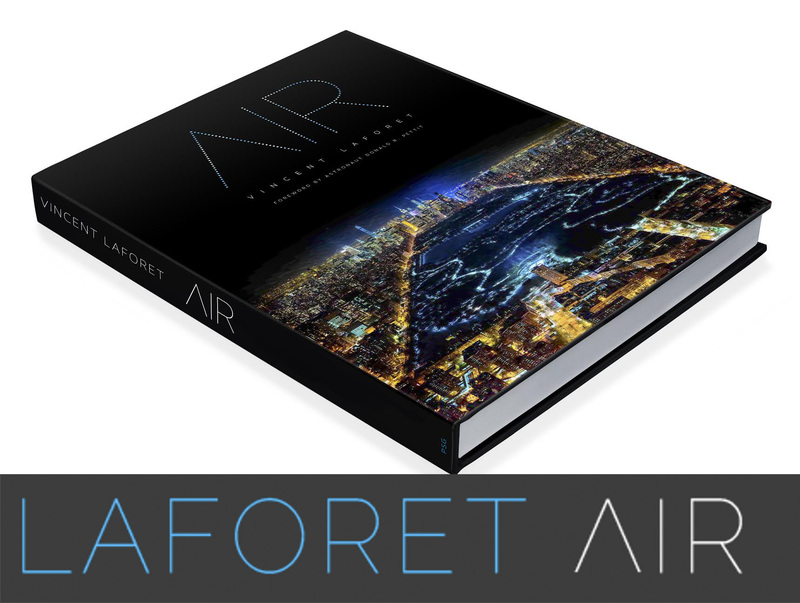 This is basically the equivalent of a high end U.S. Automobile – vs a German engineered car (the O’Connor) although one is made by an Italian company and the other by a US Company – I hope the analogy works to explain the price difference… Point is: this is an EXCELLENT fluid head – just not as refined as the O’Connor. Description (from Manfrotto): The 526 Professional Fluid Video Head directly addresses the heavy-duty, high-end ENG and EFP video market by offering a feature-packed fluid video head that borrows all the combined benefits of our 500 series heads with the ability to support top weight loads over 15lbs. The 526 features a replaceable and removable pan arm rosette so if any damage occurs to the side castings, only a small part needs to be replaced; large rubber padded knobs for better grip and all the controls (tilt and pan lock, tilt drag) are located on the left side so they can be easily found. The 526 offers our most precise fluid drag system comprised of three step settings for low, medium and high drag levels (numbered 1, 2 and 3), plus the additional no-drag setting (number 0) for such occasions as snap-pans/tilts. Counterbalance is achieved through an adjustable spring for camera weights between 17.5 and 33 lbs. The built-in 4-inch half-ball adapts to a number of our tripods with a 4-inch receiver, allowing the quick leveling of the camera with the aid of the bright leveling bubble. Comment: Heavenly – but expensive relative to the heads above. I won’t work with any other head – as O’Connor fluid heads are the industry standard for all motion pictures (this model and the larger models for heavier cameras.) The pan/tilt friction is unparalleled – as is the ability to perfectly balance a camera so that you can let go of it "in position" without having to lock the unit down is something to marvel at. Once you work with this fluid head you won’t want to work with anything else. It’s an investment for sure – but one piece of gear you’ll use for the rest of your career. This is the updated version of the 1030HD. I first got to try one out on the set of my short film, "Mobius." The head supports rigs up to 30 lbs., which we were close to maxing out with the fully built out C300 and Canon Cinema Zoom lenses. The 1030D’s superior counterbalance system came in handy with these lenses as they are much larger and heavier than the C300 body. 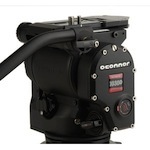 Description (from OConnor): An updated replacement of the popular Ultimate 1030HD and HDs, the new line offers a sporty industrial design and a slew of features that have been borrowed from the larger OConnors to let cinematographers seamlessly transition from heavier to lighter payload camera setups. These include the stepless, ultra-smooth pan and tilt fluid drag specifically enhanced to provide ultimate control and stability for digital cinematography shooting. The patented OConnor Sinusoidal Counterbalance system provides true, accurate balance at any point in the tilt range. Users will appreciate that the system Counterbalances down to zero, a handy advantage since there is a trend to lighter weight cameras. For today’s versatile shooter, the transition from larger to smaller payloads has never been easier. And most importantly, the famous OConnor feel, remains the same regardless of payload. Comments: I’ve never liked these, but I can’t ignore that a LOT of indie / Documentary shooters absolutely SWEAR by these… Faster, smaller, and much more nimble than a tripod and this will make a huge different in stability versus handheld obviously. 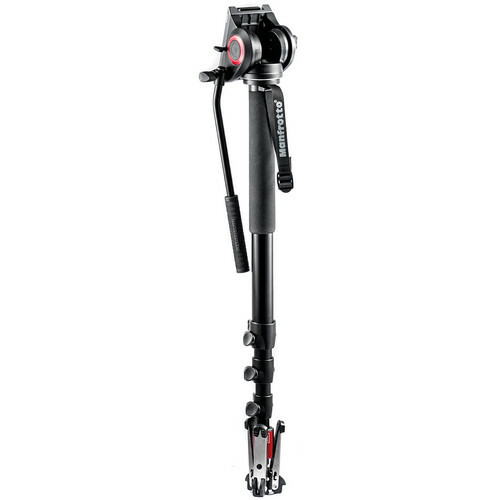 Description (from Manfrotto): The MVM500A is a lightweight fluid monopod with a specially adapted 500 video head attached. It has an innovative fluid pan cartridge incorporated into the monopod base that gives you an incredibly smooth panning action. Great compactness while folded thanks to the three retractable feet. The patented fluid monopod features wider platform for HDSLR bodies and the sliding plate travels to balance the latest interchangeable lens cameras. The fluid monopod ensures smooth shots and fine control with up to 5kg (11 lbs) of equipment. Comments: This is an excellent set of sticks – very fast to deploy and adjust. The advantage is that is can support a LOT of weight and has a great Max height. 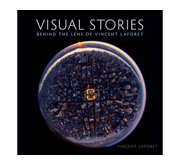 It is a non-standard video set of sticks – see below. I travel with this everywhere, as I use this both as my 2nd set of sticks w/ a fluid head – and to support sliders, JIBs and other equipment. Description (from Manfrotto): The new 536 video tripod is incredibly high and stable, has a great load capability and great max height with an ergonomic, easy-to-use and compact design. This lightweight tripod features a new leg angle selector, developed for adjusting the leg angle in a quick, easy and precise way. In addition, a screw-in 75/100mm adapter to hold the different industry standard half-ball heads. Comments: This is the go to set of sticks for professionals who work with Manfrotto gear – reliable and versatile. Extremely fast to get in place and adjust. Description (from Manfrotto): Two-stage, extremely rigid, stable tripod. Able to carry loads up to 20kg (44lb). The 546B has a die cast aluminium crown with a built-in 75mm bowl. The tripod’s telescopic mid-level spreader helps set leg angles accurately. Leg locks are secure and reliable, and spiked feet with rubber overshoes are provided for solid grounding on both uneven terrain and smooth floors.The tripod can be used with various dollies. Comments: A solid set of professional sticks that will carry just about anything HDDSLR related that you throw on it – not to mention sliders and JIBs. 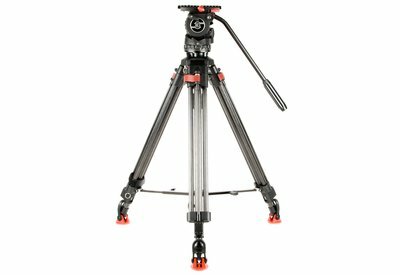 Description (from OConnor): Lightweight Carbon Fiber, Two Stage Tripod, horizontal lever locks for quick, safe & secure leg adjustments. 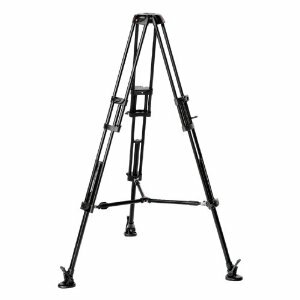 This lightweight tripod has a range of 15" to 66" while maintaining an extremely stable platform. Comments: The Sachtler FSB 6 Fluid head combined with 2 stage carbon fiber tripod is an ideal solution for filmmakers looking to achieve stable movement and best possible images. The head features Frictionless Leak Proof Fluid Damping system that has 3 levels of drag to ensure perfectly smooth pans and tilts. With load capacity between 2.2 and 13.2 lbs this system is ideal for use with latest cameras like Canon C100, C300, C500 as well as Sony FS700 and similar. 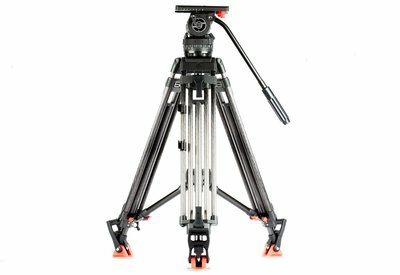 Description: The Sachtler FSB 6 Fluid head combined with 2 stage carbon fiber tripod is an ideal solution for filmmakers looking to achieve stable movement and best possible images. The head features Frictionless Leak Proof Fluid Damping system that has 3 levels of drag to ensure perfectly smooth pans and tilts. With load capacity between 2.2 and 13.2 lbs this system is ideal for use with latest cameras like Canon C100, C300, C500 as well as Sony FS700 and similar. Comments: Our Sachtler DV-12SB Fluid Head with 100mm ball is mounted to the CF-100ENG 2CF carbon fiber tripod legs. This system includes a mid-level spreader, rubber feet, and a padded carrying bag. This system will hold up to 31 lbs, giving you the smoothest pans even with a heavy rig. 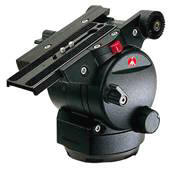 The head offers a 12-step counterbalance with a 3″ sliding plate to make the balance ideal on any configuration. It also has 5 steps of drag in both axes to give you just the right amount of push back. Sachtler’s Touch & Go quick release system allows you to snap a heavy rig into place and lock it down easy. The feet feature the included rubber feet, or take them off to use the spikes. The 4-stop multi-level spreader is a favorite around the office here for it’s ability to consistently give you the spread you need at the right time. The whole system weighs a little over 12 lbs. 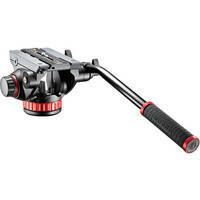 Description: Our Sachtler DV-12SB Fluid Head with 100mm ball is mounted to the CF-100ENG 2CF carbon fiber tripod legs. This system includes a mid-level spreader, rubber feet, and a padded carrying bag. This system will hold up to 31 lbs, giving you the smoothest pans even with a heavy rig. 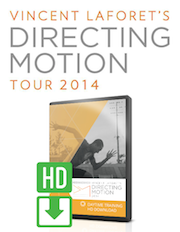 The head offers a 12-step counterbalance with a 3″ sliding plate to make the balance ideal on any configuration. It also has 5 steps of drag in both axes to give you just the right amount of push back. Sachtler’s Touch & Go quick release system allows you to snap a heavy rig into place and lock it down easy. The feet feature the included rubber feet, or take them off to use the spikes. The 4-stop multi-level spreader is a favorite around the office here for it’s ability to consistently give you the spread you need at the right time. The whole system weighs a little over 12 lbs. If a tripod is counter balanced, is it implied that it is a fluid head? Or can there be simple ball heads/pan-tilt heads with counter balance as well? 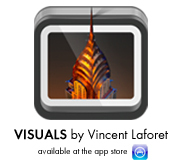 Thanks for sharing this nice blog. I read it completely and get some interesting blog content . I am waiting for your new blog pleas share new blog information my Email id. i wish to again on your new blog keep sharing with your article. the last partt 🙂 I care for such information much.